In rare rolled condition, with a lovely original snipe with the cinemas details. Fantastic rolled condition, original snipe on bottom. For Further details or information on backing or framing of this poster please see our website Orson & Welles. 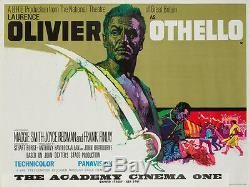 The item "Original UK Quad, Othello 1965, Film/Movie Poster rolled, Laurence Olivier" is in sale since Monday, July 4, 2016. This item is in the category "DVDs, Films & TV\Film Memorabilia\Posters\Originals - UK Quads\Pre-1970". The seller is "orsonandwelles" and is located in Bath. This item can be shipped worldwide.